Did you know we have a duck? His name is Luigi and he's going to be 12 years old this spring. 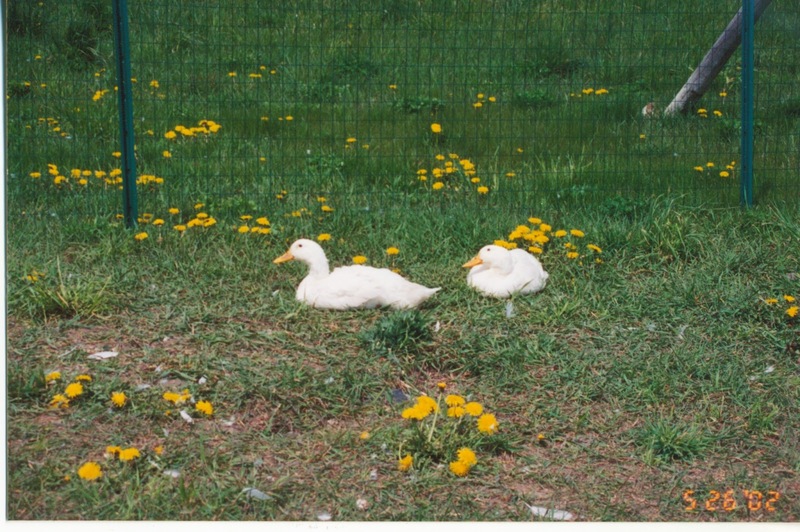 If ducks are kept as pets, they can live up to 20+ years. Why a duck? My husband had one as a kid and was telling me how great it was, so we picked up a couple ducklings. One of these days I'll get him to write down his adventures to share. 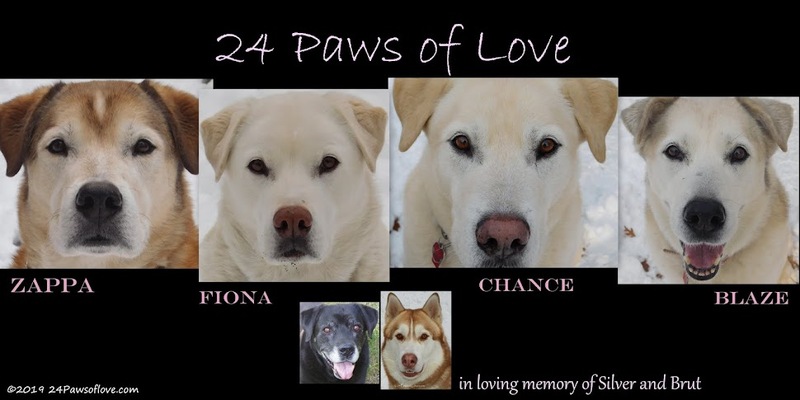 They were so darling as little ones and grew faster than weeds! You could almost watch them grow it was so fast. I fell in love right away. 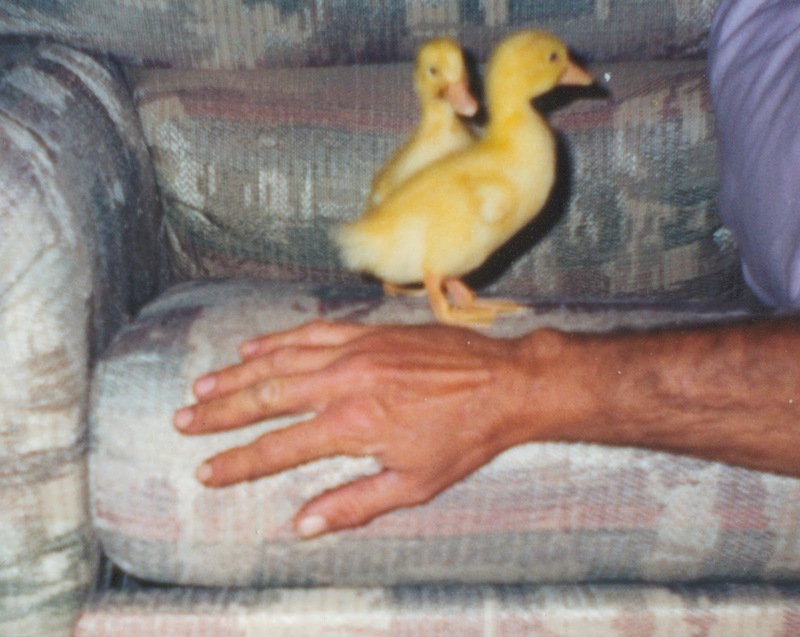 The ducklings bonded to each other than to us and that was a blow to my husband because his duck used to follow him like a dog. Before long their yellow downing was replaced by white feathers. Mojo died after a couple of years, as a predator got her. It was the saddest thing I ever saw as Luigi just kept walking in circles around her body in the corner of the yard. They were such a team it was almost like he lost a part of his physical self. He was lost for those few months without her. If you don't know, ducks are quite violent during courtship. The male chases and grabs the female's neck always trying to push her to the ground. It was painful to watch. Had I known some of what I know now I would have separated them, but then they were just doing what came naturally. Mojo's feathers on her neck were gone, it was pretty gruesome. It was with peace that she died when she did. So then we were left with just Luigi. It took me a while to forgive him, not for Mojo's death, but what looked like an abusive relationship between the two of them. It hasn't been until the last couple of years that I began working with Luigi to eat out of my hand. The only time he ever came close to me was usually in the winter when I would come out with the food and he was hungry. Since he ran from me most of the time and we never really bonded. I had to take it real slow with him, throwing food in front of him to get him to trust me to eventually take it out of my hand. Now it is part of ritual. Now I'm working on getting him to let me touch him without jumping away. My favorite part of my relationship with Luigi is when I clean his kiddie pool in the summer. He gets such a kick out having a clean pool and is a real comic with the water hose. This is when a duck is really a duck. He dives and flips in the air, flapping his wings, swimming in circles and does it again. He is a good respite from the dogs and I always sit and watch him when the pool is filling up. It one of those signs that all is alright with the world when Luigi is going crazy in his pool. In the winter I have a smaller tub, it is actually a grout tub that I bucket water to on the milder days so he can have his bath. Sometimes I think he likes the tub as much or more than his pool. Someday I'd love to have a little pond for him where he can really swim and enjoy himself. He has two pens, one that is fully enclosed for winter and nighttime and one for spring, summer and fall where he can get out and frolic in the grasses during the day. If I thought I didn't understand dog or cat language, it's been nothing trying to understand waterfowl!! But having Luigi has been such a cool experience and I never thought I could fall in love with a duck. And I did just that! Quack quack Luigi. Nice to meet you. Have a wonderful quacking Wednesday. I always had ducks growing up and loved them. My last duck, weirdly enough, bonded with my goat. They were such an odd couple, but the goat kept her safe. 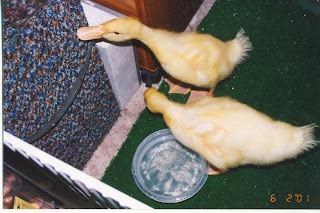 I had two ducks growing up. How cute, I had no idea they lived that long. I didn't realize they lived so long! Luigi sounds like a lucky-duck.